survey methodology and related information appears on page 6.
series, ITA-9008(81)-1, issued July 1981. Revised by 5 percent or more from previously published figures. 'Represents copper content weight, rather than metal weight. 2Represents uninsulated, bare tinned, and/or alloy coated wire. 3Source: Bureau of the Census Current Industrial Reports Series M33E, Nonferrous Castings. Bureau of the Census, Industry Division, Washington, D.C. 20233, or call Robert Marske, (301) 763-2528.
national money order or by a draft on a U.S. bank. Price, 25 cents per copy, $1.25 per year. tories of Brass and Copper Wire Mill Shapes. rRevised by 5 percent or more from previously published figures. (Z) Less than 500,000 pounds. 3Represents copper content weight, rather than metal weight. SSource: Bureau of the Census Current Industrial Reports Series M33E, Nonferrous Castings. 'A comparison of domestic manufacturers' shipments, export, and import codes for copper-base mill products appears in table 6. 2Source: Bureau of the Census Report FT-410, U.S. Exports--Schedule E--Commodity by Country. mill products) are based on data for 1977 which are published in Origin of Exports of Manufactured Products, MC77-SR-12, appendix B. 4Source: Bureau of the Census Report IM 145-X, U.S. Imports for Consumption and General Imports. 'Represents the c.i.f. (cost, insurance, and freight) value at the first port of entry in the United States plus U.S. import duties. 6Apparent consumption is derived by subtracting exports from the total of net shipments plus imports. 7This total does not include either insulated wire and cable products or brass bronze foundry products. of primary companies are available in Current Industrial Reports Series M33K, Inventories of Brass and Copper Wire Mill Shapes. Revised by 5 percent or more from previously published figures. (Z) Less than 500,000 pounds. pany under toll arrangements for the account of controlled materials consumers. in the cupping and discing operation. 3Does not include electrical wire. "Reported in copper content weight rather than metal weight. 'Wire, uninsulated, bare, tinned, and/or alloy coated. pany. Also includes castings produced and consumed at the same location in the production of finished products. 'Source: Bureau of the Census, Currrnt Industrial Reports Series M33E. Nonferrous Castings. (Z) Less than half the stated unit of measure. 'Comparison of domestic manufacturers' shipment, export, and import codes for copper-base mill and foundry products is shown in table 6.
zSource: Bureau of the Census Report FT-410, U.S. Exports, Commodity by Country. products) are based on data for 1977 which are published in Origin of Exports of Manufactured Products, MC77-SR-12, appendix B. 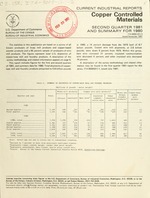 'Source: Bureau of the Census Report IM 145-X, U.S. Imports for Consumption and General Imports. 'This total does not include either insulated wire and cable or brass and bronze foundry products. 'The import and export codes for this line do not include wire. wire mill products are inflated to represent 100 percent coverage. There are 188 companies reporting on this survey. imputation greater than 10 percent are footnoted. difference between the actual and imputed figures is unknown. however, increases as the percentage of imputation increases. previously made as described above, and other corrections. previously published figures are indicated by footnotes. the three types of data. allowances, exclusive of freight charges and excise taxes. insurance, and other charges to the export point. plant to the export point. and other charges to the import point. exports) at four-digit or broader levels may be understated. are appropriately noted in the table. March 1979 and for shipments under $251 prior to March 1979.
when intermediaries (wholesalers, exporters, etc.) are involved. extent that used or rebuilt products are significant in trade. reflect the movement of merchandise into and out of the U.S.
data exclude Puerto Rico and other outlying areas. U.S. Government Printing Office Deposit Account No. Total charges $ Fill in the boxes below. I I I I I I I I I I I I I I I I I I same address). to keep up with what's going on in the more than 50,000 companies that comprise the U.S.
current conditions and trends from the Bureau of Industrial Economics. Return this coupon now to start your subscription. :kVISA Total charges $ Fill in the boxes below.